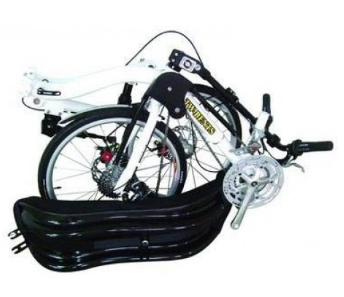 A recumbent bicycle is a whole new riding experience for most cyclists. The bike shown here has a shorter wheelbase than a more typical recumbent bicycle and a higher seating position. I would actually liken it to a semi-recumbent in that regard. This should enhance the handling characteristics and overall performance. 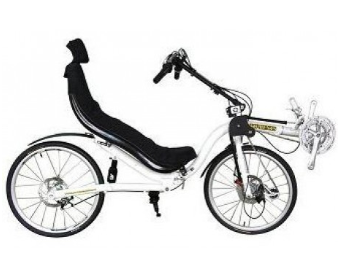 A recumbent bicycle is lighter than a recumbent tricycle which is the more common of the two. Starting and stopping a recumbent bicycle takes a bit more getting used to with the balance issues but you can still sit comfortably while seated like on a recumbent tricycle. This bike is also fold-able for easier transport and being a bicycle it takes up less space when folded than a tricycle. Having 24 speeds helps significantly in steeper climbs and having a seat back is a big plus as well. Being able to fold this bike is a huge plus for storage and transport . It will fit in just about any SUV and most car trunks. Tire： Kenda high pressure F/20", R/26"